Tata Motors, the multinational automotive manufacturing company established in the year 1945, started its commercial vehicle operation in 1954. The company has wide presence in every segment be it is trucks, mini-trucks, tractors, tippers and pick-up trucks. 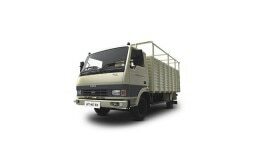 Its most popular models include Tata Ace, Tata LPS 4018 and Tata SFC 407 EX Pick Up. These products along with some others have carved their own niche in the market with their best in class features and powerful performance. The price range of Tata Trucks starts from INR 7.70 lakh, Tata Tippers from INR 9.37 lakh, Tata Tractors from INR 19.24 lakh, Tata Pick-up trucks from INR 6.05 lakh and Tata Mini trucks from INR 2.61 lakh, (all ex-showroom) catering to each and every essential requirement of day to day life. Company has well in advance equipped its entire fleet of commercial vehicles with BS-IV technology. The environment friendly BS-IV technology includes Exhaust Gas Recirculation (EGR) and future leading Selective Catalytic Reduction (SCR) system meant for better power, fuel efficiency and low carbon emissions. The globally proven SCR technology would also enable Tata Motors to easily implement BS-VI norms in future. After so many years with its presence in every nook and corner of the country, Tata Motors has become the largest commercial vehicle manufacturer in India. The Tatas have cemented their position steadily and cleverly in each and every segment. From trucks and buses to municipal solutions and defence & homeland security, it has rightly sensed the requirements of the people. The expansive global presence of Tata Motors in Europe, South America, Africa, Middle East, South Asia, South East Asia, Australia, CIS and Russia, in the form of over 6,600 dealership, service centers, sales and spare parts centers, is a proof that company has left indelible mark in the field of commercial vehicles.